First we started with a blue piece of construction paper. I made an outline on the bottom part of the paper where we were going to put the sand and let my little guy fill it in with more glue. I spread the glue out to make the "ocean floor." Then my littel guy sprinkled sand all over to cover the glue. I cut some fish, seaweed, starfish, and an anchor (his idea) out of different colored construction paper. I asked him if he wanted to color the cutouts, but he didn't (he's not real big on coloring) so we just talked about them and I asked him what belongs in the water and what belongs on the ocean floor. He placed the cutouts and shells in the correct place in the scene. He had fun playing with it, pretending the fish were swimming and the crab was walking on the sea floor. You could use any sea creatures you have to let them play with in the ocean scene. 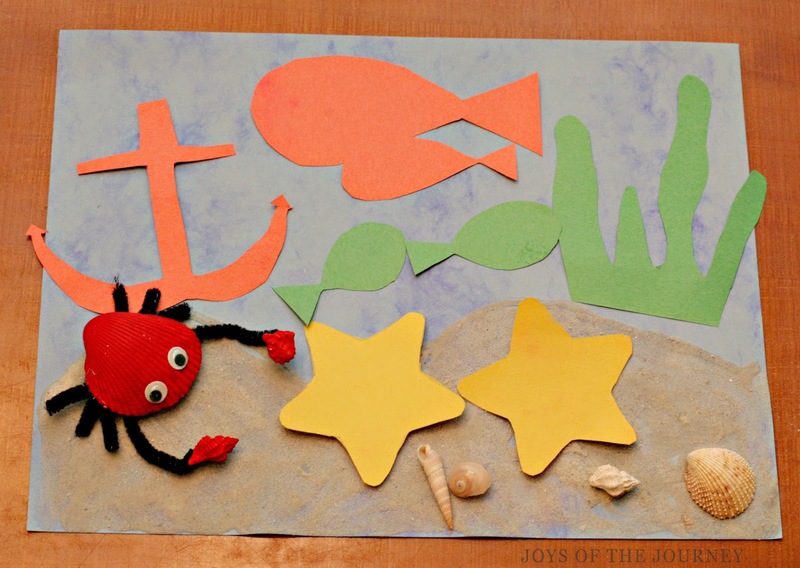 We had already made a couple of these cute little crabs with the shells we collected from the beach and used them for play. For the crab, we used a big scallop shell for the body and two smaller shells for the claws. I hot glued pieces of black pipe cleaner to the bottom of the big shell for legs. Then we hot glued a 2 inch piece of pipe cleaner to the two smaller shells and glued the other end of the pipe cleaner to the big shell to attach the claws. My little guy added the google eyes and there you have it! 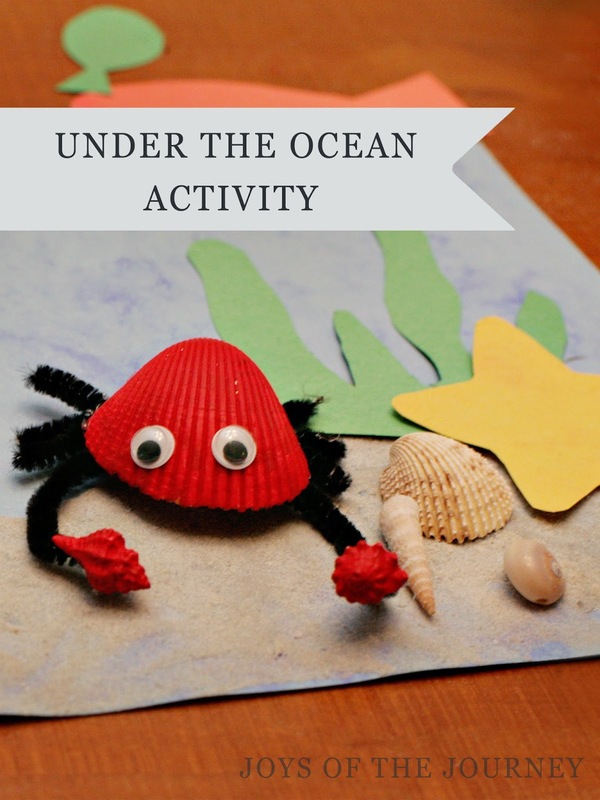 My preschooler loved this activity and it helped him to learn about marine habitat and which animals lived where in the ocean!